Mussels on a weeknight? Don't mind if we do... Mussels are actually super affordable ($5 for 2 lbs), really quick to cook, and fun to eat. Pair them with a fantastic Chardonnay, some fresh baguette, and you got yourself a delicious meal. Nigel got me David Chang's cookbook for Christmas, and this was our first attempt at one of his recipes. The book intimidates me a bit, so we figured we would start with something 'simple.' Enjoy! Start by cleaning the mussels. In a large bowl filled with cold water, let the mussels sit for a few minutes. Then, one by one, scrub their shells clean and (don't be scared) rip off the "beards" - little fuzzy bit sticking out of the shell. Set aside. In a small bowl, combine the miso, vinegar, ginger, scallions and garlic. "Smash" all the ingredients together and set aside. Pour the oil into a large pot, and set over high heat. Once the oil is hot, but not smoking (roughly 1 minute), carefully add the mussels. The oil will pop/splash so be careful! Cook for 1 minute and then add the sake. Stir well. Cover the pot and steam the mussels until they open - approximately 4 minutes. Remove the lid from the pot. Shift all the mussels to one side and slowly add the miso mixture to the liquid. Stir to combine the paste with the liquid, then toss the mussels into the sauce. 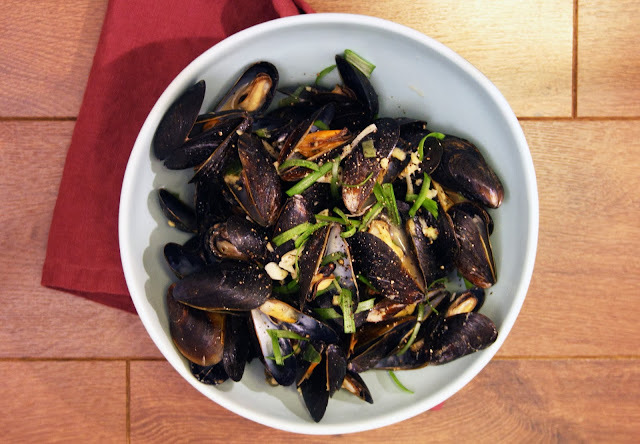 Using a slotted spoon, transfer the mussels to serving bowls. If any did not open while cooking, discard immediately. Add a heaping spoon of broth to each bowl, sprinkle with sliced scallions and black pepper. Serve immediately.